Are you ready to Dress Up, Spell Words, and Raise Money for Education? 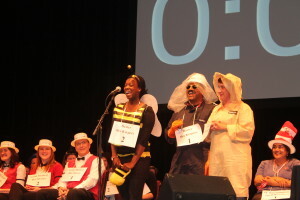 TODAY is the The Great Grown Up Spelling Bee! 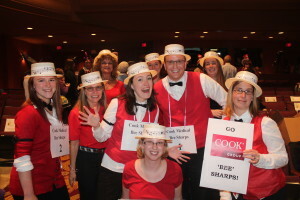 The Great Grown-Up Spelling Bee is our largest annual fundraiser. Come join the fun and help us inspire learning and enrich teaching for all MCCSC students. John Whikehart, our Emcee will be joined by Bruce Calloway as the official word Pronouncer. Celebrity judges are Dr. Judith DeMuth, Dr. Larry Rink, Randy Lloyd. Also joining us will be Nancy Baldwin as our Time Keeper, and Judge Valeri Haughton-Motley as the Master Popper. Not sure what that is well join us and find out! All proceeds will benefit MCCSC Students. Our goal is to raise $40,000! Gifts to support education for our students can be made at the event or online. Thank you for your support. Thank you to all of our sponsors and spelling teams for making this event successful. See what the Herald Times has to say about the event.